Transform any room into a starry night sky filled with constellations! Float away in peaceful slumber under a beautiful star-filled sky. Twilight Ladybug makes bedtime fun and helps ease children's fear of the dark by projecting a starry night sky onto bedroom ceiling and walls. Stars and Ladybug shell illuminate in three magical colors to help children sleep easier. The perfect sleep companion for children 3 and up! Twilight LadyBug is more than soothing, it is an educational interactive tool to learn about constellations! Parents can sit with their children and identify eight major constellations using the fully illustrated Twilight Ladybug Star Guide. 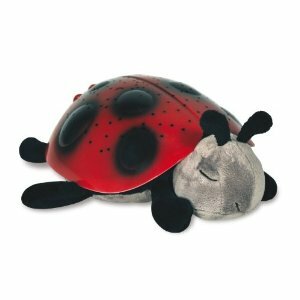 Click here to check out our new Turtle Snug Rug too - a perfect companion to the twilight LadyBug. Lay on this great rug to enjoy the show.